In many African states, the immediate post-colonial era of democratic politics proved to be short-lived as leaders quickly consolidated power to create de facto or de jure single party states. Hence, the reintroduction of multi-party politics following the Cold War appeared to position the continent as the new frontier of democracy. Even as countries such as Rwanda saw internal and external pushes for rapid liberalization resulting in episodes of political or mass violence in the 1990s, de jure multi-party politics and regular elections remained an accepted norm. Initially marred with blatant ballot stuffing and missing ballot boxes, elections saw ruling parties determined to hold on to power fine tune their tactics in order to abide by superficial criteria of “free and fair” polls on elections day. As monitoring tools, international missions and electoral processes became more sophisticated, autocratic regimes moved from obvious rigging to attacking the competitiveness of the already challenged opposition. Hence control of independent media, civil society organizations and the political space of the opposition have become prime targets of some regimes. But what constitutes free and fair elections? In theory, international norms require more than a transparent and well-managed election day. They also call for full and unhindered citizen participation, political space for opposition to operate on a level playing field, a free and independent media, and an independent judiciary. Yet, as monitoring missions often arrive late in the electoral campaign, some of these criteria are violated and are often ignored or only mentioned in passing in the final monitoring report, which then qualifies obviously unfair elections as having met at the very least the minimum requirements of transparency. This is what happened in Burundi in 2010 and is now contributing to the current crisis. Burundi’s 2010 elections should have been crucial sign of things to come. The electoral campaign was marred with harassment, intimidation and arrests of opposition members. By the end of the local elections, most of the opposition opted to boycott the remainder of the polls. The aim of the boycott was to delegitimize the electoral process, but instead it emboldened the ruling party, which gained a crushing majority in the legislature. This miscalculation by the opposition contributed to the advent of a de facto single-party state, which in turn enabled the ruling party to pass a series of legislation that further eroded democratic consolidation and set the stage for the current crisis in Burundi. While this misstep was costly to the opposition, it can hardly be blamed given the conditions under which it was forced to operate. The European Union Monitoring mission, while taking note of the pre-elections repression, declared the elections to be free and fair, and this despite arguably going against its own criteria of transparent elections. It is possible that the international community validated the electoral process, however flawed, in order to avoid a political crisis and a possible return to violence. What followed was two years of low-grade violence between the ruling party and the opposition, which appeared to be an acceptable cost to the international community. However, five years later, Burundi finds itself in familiar territory with a much more serious crisis than in 2010. During this election cycle, true to form, the ruling party has followed the same patterns of repression. Since its failed attempt to change the constitution in 2014, the government has consistently bullied the opposition, restricted the media, and intimidated civil society organizations. Civil right activists, journalists, and ranking members of the political opposition have been harassed and jailed. Political parties have been unable to hold political meetings while the voter registration process was marred with irregularities. But it is Nkurunziza’s decision to run for a third mandate, despite the Aursha agreement and a generally accepted reading of the constitution that limits presidential mandates to two terms, that pushed the political contest over the edge. A compromised constitutional court sided with the ruling party, with a controversial interpretation of the constitution, further eroding trust in state institutions among dissidents. The recent failed coup attempt led by former head of intelligence, Major General Niyombare, has further emboldened the ruling party and the executive, which now clearly acts outside of the limits of the constitution. This includes controlling the electoral calendar, which should fall under the jurisdiction of the electoral commission, and unilaterally reallocating budget funds to make up for the financial support withheld by international partners. Moreover, government forces destroyed most independent media outlets and the police continue with violent repression of protests. As over a hundred thousands Burundians have fled the country the opposition continues to be harassed and is unable to campaign. The international community, and most importantly, regional actors have now recognized that the situation on the ground in not conducive for free and fair elections. Consequently many have withdrawn their support for immediate elections citing the impossibility of holding free and fair elections under such conditions. Researchers are now increasingly addressing how savvy heads of states have been able to leverage democratic institutions to remain in power and promote durable dictatorships. By manipulating elections, legislatures, and legal institutions, regimes can then strengthen their hold on political power while mimicking democratic rituals and behaviors. In the Great Lakes Region, this trend is particularly worrying when we consider the fact that Burundi is not surrounded by hallmarks of democracy. Indeed, the same research suggests that as regime types within a region tend to spread from one country to another, we may see the emergence of consolidated autocratic blocks. 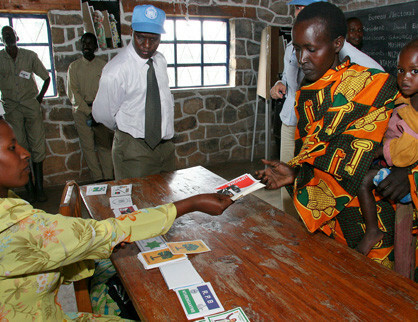 Burundians, and other Africans approaching elections, will need to determine whether this type of continuous closing of the political space prior to elections in which human and political rights are constantly and blatantly violated, followed by clinically “free and fair” elections, can continue to go unaddressed by regional actors and the international community in a rising Africa. Dr. Yolande Bouka is a Researcher in the Conflict Prevention and Risk Analysis Division at Nairobi’s Institute for Security Studies, a member organization of the Wilson Center Africa Program’s Southern Voices Network. Follow her on Twitter @yolandebouka.